Kidrobot X Keith Haring Special Edition | 'TAIN'T THE MEAT… IT'S THE HUMANITY! Regular readers of ‘TaintTheMeat.com will know of my fondness for Kidrobot‘s collection of vinyl toys, particularly the oversized editions. This Keith Haring limited edition, apart from being an attractive figure in it’s own right, also has the benefit of being released to support a noble cause. 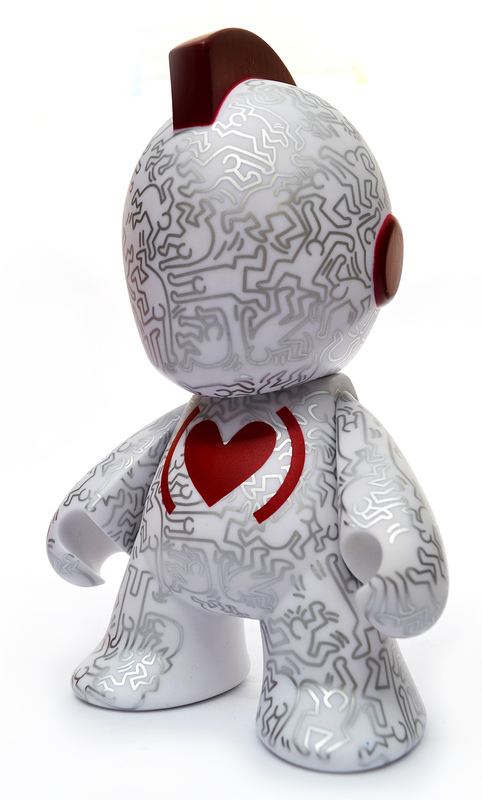 Released in conjunction with AIDS charity (RED) in November 2013 this seven inch vinyl figure features Kidrobot’s mascot bot decorated with Keith Haring’s iconic dancing figures. The robot is bright white and the decorations are printed in metallic silver paint. The figure also has a bright red heart painted on it’s chest. Haring’s artwork also adorns the attractive box, which is bright red with metallic red decorations, and features a window in the shape of Africa. The overall presentation of the figure is very high and I particularly like how the silver metallic ink reflects the light — this really is a lovely figure. Since his death from an AIDS related illness in 1990, Keith Haring’s work has become synonymous with social awareness and compassion and his iconic artwork is the perfect choice for this limited edition figure. Kidrobot X Keith Haring Special Edition can be purchased for around £/$30, with 5% of profits going to (RED)’s campaign to create and AIDS-free generation in Africa by 2020. Here’s hoping they succeed.